PLEASE NOTE: The 2677MG Twinax Display Station is no longer manufactured. 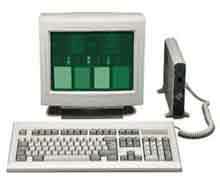 The 2677m Modular Twinax Display Station is the direct replacement for the2676d. Click here to be taken the 2677m page. The I-O 2677MG Display Module is a low cost, modular midrange display device which is compact and fully featured. The I-O 2677MG includes a 14" green monitor, display module, a 102/103-key or 122-key keyboard, and a universal power supply. The 2677D has been discontinued. The 2677m Modular Twinax Workstation is the direct replacement for it.